In January 2008 the Colorado State Library Jobline celebrated its first anniversary at its new home, www.LibraryJobline.org. The new Library Jobline, unlike the original website, is database driven and gathers detailed information about job postings. This new interface allows both employers and job seekers to customize their use of the site. In addition, it allows for the compilation of data about job vacancies, including number of postings, library type, educational requirements, and reason for the position vacancy. 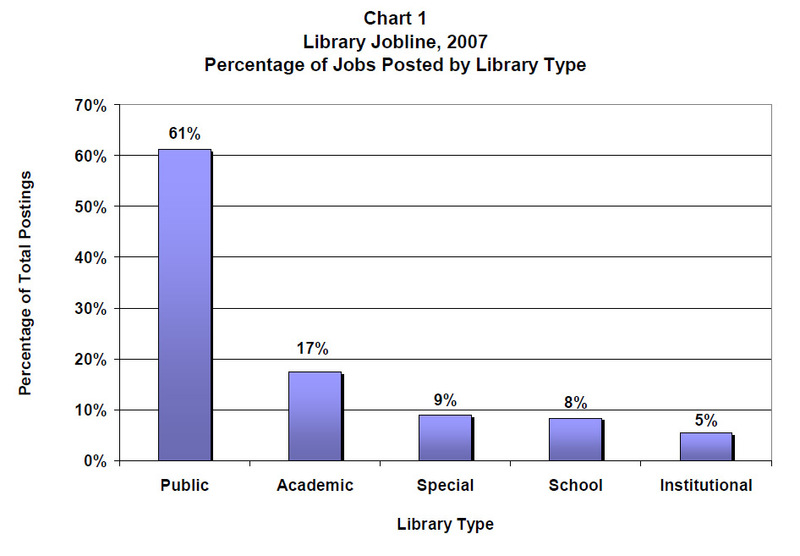 This report examines some of this data based on the 552 jobs posted to Library Jobline in 2007. Of all library types, public libraries posted the most job openings on Library Jobline with nearly 2 out of 3 listings (61%). This is not particularly surprising, given that public libraries employ more staff than any other library type.1 Academic libraries were a distant second with fewer than 1 in 5 of the jobs posted (17%), followed by special (9%), school (8%), and institutional (5%) libraries. Seven postings indicated more than one library type (see Chart 1). A master’s degree was required at varying levels among different library types. 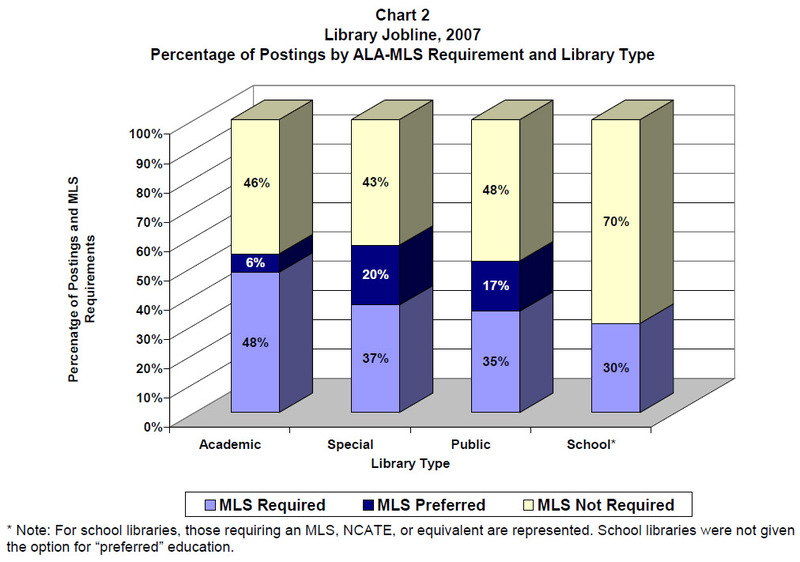 Public, school, and special libraries required an ALA-accredited MLS degree for about one-third of the jobs they posted. Academic libraries required the degree most frequently, with nearly half of positions posted indicating the degree was required. However, special and public libraries were much more likely to prefer an MLS degree than were academic libraries. For all 3 of these library types, more than half of the jobs posted either required or preferred a master’s degree (see Chart 2). 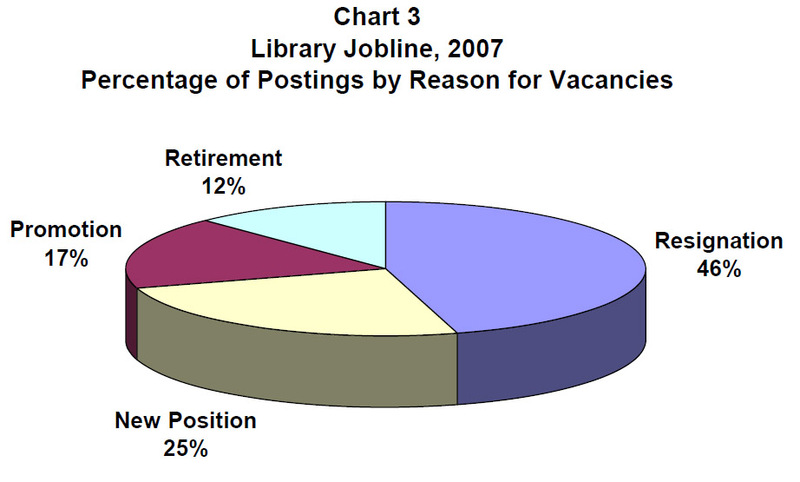 Employers posting to Library Jobline were asked the reason for the job vacancy. Of those who responded to this query, nearly half said the opening was created by a resignation (46%). Far fewer indicated they were trying to fill openings created by promotions (17%) or due to retirements (12%). A surprising and heartening 1 in 4 jobs listed were new positions (25%). Such a high rate of new openings suggests a continued demand for librarians in the Internet age (see Chart 3). The first year of the new Colorado State Library Jobline gives us a brief glimpse into the types of jobs being posted for library staff. Notably, there continue to be new jobs created in the field, a master’s degree still seems to be relevant, and the desire for Spanish-speaking employees appears to be desirable in new positions. The real power of the new Jobline site, though, lies a few years down the road. As we harvest more information over time we will be able to follow trends in the job market and view a more complete picture of how the library workforce landscape is changing. For more information on posting a job or viewing current job openings, see www.LibraryJobline.org.